PESHAWAR, May 2 2016 (IPS) - Pakistan’s Federally Administered Tribal Areas (FATA) is widely viewed as one of the world’s most dangerous places to be a journalist, with at least 14 killed since 2005 and a dozen of those cases still unsolved, according to local and international groups. “The situation is extremely bad,” Ibrahim Shinwari, a former president of the Tribal Union of Journalists (TUJ), told IPS. “About 350 reporters working in all seven districts of FATA faced security threats. About 40 of them have left FATA and report stories from the adjacent Khyber Pakhtunkhwa province,” he said. FATA lies along the border with Afghanistan. When U.S.-led coalition forces toppled the Taliban government in Kabul towards the end of 2001 after the terror attacks in Washington and New York, the Taliban crossed over to FATA to escape U.S. attacks. From there, they targeted Pakistani forces as well as the local population and government-owned buildings, including schools and hospitals. Beginning in 2014, Pakistan’s military launched Operation Zarb-e-Azbhas, a massive ground and air assault targeting various Islamist militant groups. But the crackdown has also brought new restrictions on the media. Last August, the information ministry issued a draconian code of conduct barring broadcasters from airing material that “contains aspersions against the judiciary or armed forces”. And journalists continue to be harassed and even murdered with virtual impunity. “No one has been held responsible for killing journalists. There was only one inquiry into Hayatullah Khan’s murder, which was never made public. The killings of all FATA’s reporters are a mystery,” Shinwari told IPS. Khan, a freelancer and reporter for the Urdu-language daily Ausaf, was found shot to death in North Waziristan in June 2006. He had been kidnapped by unidentified gunmen six months earlier. According to the New York-based Committee to Protect Journalists (CPJ), Khan had received numerous threats from Pakistani security forces, the Taliban and local tribesmen because of his reporting. His killers remain at large. The day before he was abducted, he had published photographs that helped to expose Washington’s secret U.S. drone programme in Pakistan. In November 2007, Khan’s widow was killed in a bomb blast outside her home. The situation in Khyber Pakhtunkhwa, one of Pakistan’s four provinces, is more or less the same, with two journalists killed in a single week this year (the first to be killed in the Asia Pacific region), according to the International Federation of Journalists. A recent report by the U.S. advocacy group Freedom House ranked Pakistan 142nd among 199 countries and territories, while Reporters Without Borders ranked it 147 with regard to press freedom in 180 countries. Shinwari said that even before the arrival of the Afghan Taliban and subsequent military offensive, FATA-based reporters never enjoyed freedoms like their colleagues in other parts of the country. “There’s no law under which we get information, and we banked on the officials who often look down on the reporters,” he said. Muhammad Anwar, a journalist from South Waziristan Agency, has been based in the nearby Bannu district of Khyber Pakhtunkhwa for the past five years due to the military campaign against the Taliban. “We face a lot of problems both from the Taliban and militants. Many of my colleagues have been killed in different districts of FATA but the killers aren’t identified as yet,” Anwar told IPS. Some reporters have relocated to Peshawar, the capital of Khyber Pakhtunkhwa, but their families are often targets back home. “The local administration and Taliban harass our relatives if they dislike some of our stories. In such circumstances, freedom of the press is a far cry away,” he said. Noted journalist Hamid Mir, who recovered from injuries he suffered in an armed attack in Karachi on Apr. 19, 2014, wrote in his column last week that he couldn’t publish the complete truth. The claims by Prime Minister Nawaz Sharif in his Apr. 22 speech to the nation, wherein he said that journalists in Pakistan enjoyed more freedom than any other country, are simply untrue, Mir wrote. “The PM boasted about media freedom deliberately as if he doesn’t know about the state and non-state actors who scared the media to follow their agenda,” he said. According to CPJ, 57 journalists have been killed in Pakistan since 1992. Thirty-three were murdered, and of those cases, 30 have gone unsolved, the group says. Threats to journalists in Pakistan, CPJ says, stem not only from militants, criminals, and warlords, but also political parties, and military and intelligence agencies. Last November, Zaman Mahsud, a senior journalist from South Waziristan, was killed by unknown assailants in the Tank district of Khyber Pakhtunkhwa. A faction of the Taliban claimed responsibility for the killing. Journalist Irfanullah Shah, who is reporting from Bannu district despite being a native of North Waziristan Agency, says that besides the lack of security, many reporters face other obstacles to doing their jobs. “About 90 per cent of the reporters are unpaid by the media outlets with which they work, therefore they are unable to pursue careers in journalism,” he said. These unpaid or under-paid reporters don’t have the resources to travel and dig out stories, and must rely on the press releases issued by the army or telephone interviews with Taliban leaders, he said. “The journalists are stuck between the army and Taliban. They have to keep both happy, which isn’t possible,” he said. 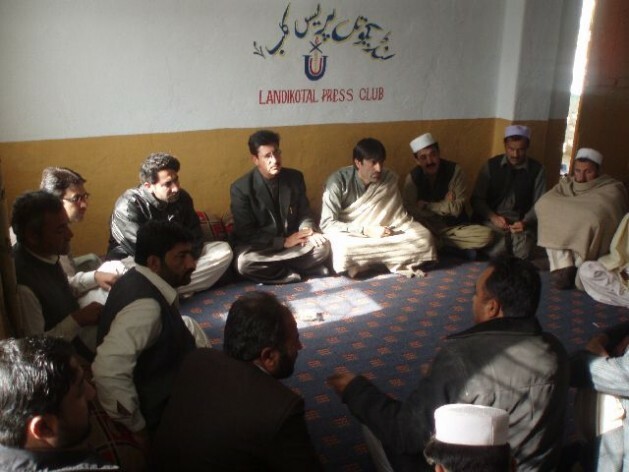 Press clubs in other parts of the country receive grants from the government, but those in FATA get only a nominal amount that is not enough to meet expenses. “Freedom of speech and media, protest, movement and assembly are being violated and curbed on the pretext of ‘national security’ or ‘national interest,” a statement by the Human Rights Commission of Pakistan said Apr. 3. It said that even genuine critiques of development plans or commitments made by the government are being demonized as against ‘national interest’.